Cath and Wren are identical twins, and until recently they did absolutely everything together. Now they’re off to university and Wren’s decided she doesn’t want to be one half of a pair any more - she wants to dance, meet boys, go to parties and let loose. It’s not so easy for Cath. She’s horribly shy and has always buried herself in the fan fiction she writes, where she always knows exactly what to say and can write a romance far more intense than anything she’s experienced in real life. Cath and Wren have always done everything together. From surviving their mother leaving them to writing fan fiction together, these identical twins are inseparable. But all that has been changing over the last couple of months as the two girls get set to start university. While Wren sports a new, funky haircut (which she didn’t consult Cath about) and is excited about moving in with a new roommate, Cath is dreading the idea of meeting new people and being separated from Wren. As uni starts and Wren discovers alcohol and frat parties, Cath feels their bond falling apart. Throw into the mix their unstable father, and Cath feels like a massive ball of anxiety. Luckily for Cath she has her fan fiction to keep her company; writing love scenes between the lead characters of her favourite novels gives her a sense of belonging. But Cath soon starts to realise that there can be more to love than what she writes in her fan fiction, and that people can surprise you. 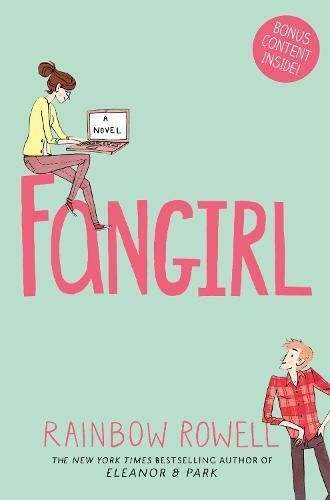 The author of the wonderful Eleanor and Park, Rainbow Rowell has written yet another brilliant coming-of-age story with realistic characters and witty dialogue that makes Fangirl really hard to put down. For ages 13 and up.